Hot this week: Father turns in son as temple thief. Temple pays for son’s rehab. Culture Crime News is coming at you from Kathmandu this week. Apologies if it is a bit late or incomplete. If I have missed any articles, please do forward them along. A review of “The Art of the Con: The Most Notorious Fakes, Frauds, and Forgeries in the Art World” by Anthony M. Amore. Sindika Dokolo and his wife Isabel dos Santos, one of Africa’s rightest couples, are buying up colonial and other looted African pieces to ‘save’ them. However his collection appears to be private. The piece was looted during the Jan 2011 revolution. The pieces were found in a ground-level apartment and had been excavated from a hole in the floor of the residence. Discussion of a museum exhibition about returned cultural property. Complicated case. The pastor of the Telpancingo temple in Morales is said to be in league with the bishop to steal money donated by pilgrims and they are accused of being in possession of stolen sacred art. An inventory of that art is missing. Ramon Castro Castro, the bishop of Cuernavaca, has stated that he is being defamed and that he has nothing to do with theft of sacred art from the Sanctuary of our Lord of Tepalcingo. The protestors are worried about highway building plans but are also calling on security to prevent looting at the site. The man took a sculpture by Dame Elisabeth Frink, he was caught on CCTV. Someone drove a truck over a burial mound, leaving tracks in what seemed to be a ‘joy ride’. The 19-year-old confessed to driving on the mounds as well as trying to climb up one. Mathew B. Brady was a pioneering photojournalist. Who would steal his historic marker? Recounting the story of Two Riders on a Beach from the Gurlitt hoard. A suspect was arrested who climbed to the top of the statue and shook it until it broke. Some of the more than 400 pieces in this private collection were more than 100 years old. Some have turned up for sale in Albuquerque. An anonymous fan has offered $1mil for the stolen slippers’ return. Whoever knows something should probably roll on their friends about now. A messy case: a billionaire gifted the looted pieces to a museum, there were 10 years of quibbling, then in April the billionaire just handed them back himself. A group of 41 movers face trial for stealing art and valuable objects, particularly from estates of wealthy dead people whose families didn’t know the extent of their collections. His cousin is challenging the will which leaves the non-looted art to the Kunstmuseum, Bern, saying Gurlitt wasn’t competent to draw it up. The coins were recovered from an auction house in Warsaw and from an individual in Poznan and have been returned to Romania. An antiques shop owner was also arrested for stealing the stolen sacred items stolen from six church robberies and ten home burglaries. Jenkins notes that singing the convention will have little practical effect on current conflicts. Shaun Greenhalgh who was jailed for creating many, many forgeries will be on a show about Lowry fakes. The artwork ‘Clarity’ was targeted in a hoax heist that was meant to criticise BP’s sponsorship of the exhibition it as in. The graffiti on the old pier wall will be removed. The piece, stolen by associates of the owner’s housekeeper, turned up at Christie’s after being missing for two decades. Among the stupidest idea’s I’ve heard. I can’t believe the author is serious. Rajan Zed, who is US-based, is urging the gallery to move faster when in comes to the return of looted Indian art. The Napoleon artefacts were stolen in 2014 but publicity about the burglary led to more donations of relevant objects to the homestead’s exhibits. 25 prints with an estimated value of $20k were stolen along with the artist Orion Das’ van in Dunedin. An update. Artist Orian Das’ stolen van was found, but his art valued at 20k was not. The statue is a copper Lord Muruga. The accused were found with the statue at a police vehicle stop. The pair were trying to sell an ivory Ganesha that they claimed to have bought in Sri Lanka 20 years ago but were unable to provide documents of purchase nor an official declaration of possession of a controlled wildlife product. The father brought ornaments stolen from the Mandai Ganpati temple to the police saying his son, who has drinking and drug problems, did it. The temple trust has offered to pay for rehab for the Mandai temple thief after his father turned him in. The watchman of this temple in Indore was asleep when the thieves broke in. The theft was noticed when he woke up. A Chola-era Shiva Parvathi sold by Subhash Kapoor that is in the Ball State University Museum of Art in Indiana in very likely looted. Have you seen this idol in situ? 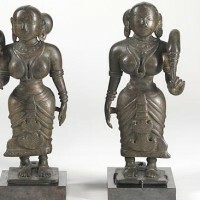 They were found to be in possession of gold ornaments and statues from the Laxminagar temple of Papannapet mandal and also from a private house. Yves Bouvier, who is accused of fraud and money laundering related to art sales, is seeking to have his Singapore-based assets unfrozen. A man is charged with stealing a painting worth NT$30mil by Chen Cheng-po from a friend who refused to lend him money. As part of the handover, the two countries signed an agreement to combat cross border smuggling of cultural objects. The 800 looted, smuggled, and recovered items were returned from various countries and were shown at the National Museum of Iraq in Baghdad. Among other things, it cites a report that says Israel has become “an international center of illegal antiquities trade and money laundering”. Apparently upon arrest the father told the Antiquities Authority that a demon in the cave kept a buried treasure there that he was looking for. This is the 2nd recent looting incident at this site. On small town plant theft.